Designing a new kitchen for your home? 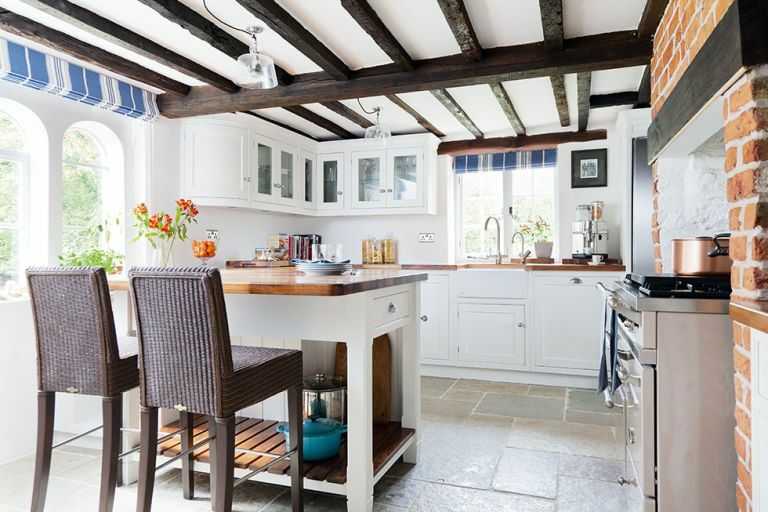 Be inspired by this stylish country kitchen – and check out all our room transformations for more clever ideas. Natasha and Ben Donovan were looking to live somewhere more spacious with a countryside location. When they came across a Grade II-listed cottage – accessed through the village cricket ground, with its own natural pond – they knew they had struck gold. Formerly three small cottages, the detached house had been turned into one property, and was full of quirky and original features. ‘Parts of it date back to the 15th century,’ says Natasha. Keen to use local companies for the project, they found Edmonson Interiors. They tasked designer Cris Sega to come up with a scheme before they had even exchanged on the property. The couple’s brief was for a timeless scheme that sat well in its period setting, but which also looked up-to-date, light and modern. ‘I couldn’t live without our lovely big fridge and freezer. I like to buy fresh local ingredients when I can, which I can store in the fridge, then cook up lots of dishes to freeze ready for when our weekend visitors arrive,’ says Natasha. A Gaggenau wine cooler was built into the run of base units alongside the Lacanche Macon range cooker housed in the chimneybreast. Copper pans echo the walnut worktops. ‘I spent a lot of time trying to find the perfect copper pans (above right) to hang alongside the range cooker. I didn’t want them to be too shiny or too matt, and I came across the perfect ones by a company called Falk Culinair. I have been collecting them ever since,’ says Natasha. Bespoke, painted cabinetry and rich walnut staved worktops from Edmonson Interiors blend seamlessly into their period setting. Painted units in a light colour help to enhance the feeling of space, with curved cabinetry softening the hard edges. A peninsular unit has been fitted, which provides both a small kitchen dining space and additional storage within the classic cabinetry design. An alcove has been turned into an island area, with the curved cabinetry below providing additional storage. The Lovell glass pendant lights are from Jim Lawrence. Edward Lloyd Loom counter stools from Vincent Sheppard. • The full feature – including stockists and more images – appears in the October 2015 issue of Real Homes. For back issues, call 01527 834435. Subscribe today to take advantage of our money-saving subscription offers.